We stopped in Leadville, Colorado last week, a picturesque little mining town that features in a favorite book of mine, William Styron's Angle of Repose. After drinking some coffee and browsing through a bookstore, my wife decided it was time to hit the thrift stores. You never know what you'll find. 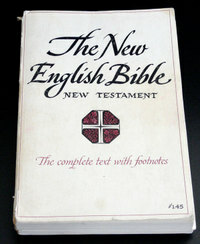 In this case, I discovered a paperback edition of the New English Bible New Testament, a joint Oxford/Cambridge. This one's a fourth printing dated 1962, printed in the United States. Some pages have fallen out -- but someone had the good grace to wedge them back in where they belong. As a result, I had a pleasant surprise. This edition seems to me an excellent example of a single-column text setting. As I've mentioned in the past, I would love to see more Bibles available in a single-column format. There's a good reason, though, why the traditional two-column approach reigns supreme. Bible designers face a unique challenge. They have to fit a great deal of text into as small a size as possible, without sacrificing readability. A single column of tiny text stretched across a wide page is essentially unreadable. A successful one-column design requires the right page size, the right margins, and the right size text. Compared to two-column designs, there are relatively few successful one-column settings to draw inspiration from, so one of my goals at the Bible Design and Binding Blog is to call attention to those I find. This NEB New Testament is one of the best I've found, even better than the Cambridge REB New Testament I highlighted in an earlier post. 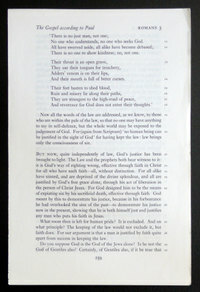 The proportions are elegant, the type is nicely sized and well laid out, and the method of indicating chapters and verses is not distracting. Let's take a closer look. When it comes to typography, I'm a traditionalist -- which is to say, a modernist. The desktop revolution was a wonderful thing for designers, but one of the unintended consequences seems to be that we don't learn typography anymore, we learn Quark or InDesign. So opening the NEB New Testament was a pleasure -- everything was so polished, so balanced. There's nothing traditional about it, of course. This is a mid-century translation displayed in a single-column setting with chapter and verse numbers off in the margin. That's positively Message-like. But this NEB New Testament seems like it was designed to a standard, not for the market. As a result, nearly fifty years after its publication, this volume appears timeless rather than dated. Consider the page proportions. (To illustrate, I've photographed one of the sheets that has helpfully fallen out!) The page measures 5.25 inches by 8 inches. The inner and outer margins are .75 inches, though some allowance is made on the outer for the verse numbers. Personally, I would have allowed a little more on the inner margin, but this is a cheap paperback, after all. The upper margin is half an inch and the lower .75 inches. The effect, as you can see, is nicely balanced. The page is filled without feeling crammed, and the text column -- which measures 3 and 5/8 inches across -- is neither too narrow nor too wide. The page size accommodates verse well, which would be trickier with just one column on a larger page. Here, by indenting the lines half an inch, the lines of poetry will the space nicely, without leaving swathes of white all around. In fact, this example illustrates one of the reasons why I believe a single-column setting is advantageous. Now that translators are apt to set so many lines in verse, two-column settings are packed with awkward line divisions. The designers of the Standard NRSV were right to switch from one column to two when they encountered lots of verse, because they were dealing with a larger page size, but when the proportions are smaller and handier, a one-column setting handles verse just fine. If we zoom in on the typographical choices (see the photo at right), I like what I see. The section heading is centered and set off in italics, and the new chapter begins with a dropped capital and a couple of words in small caps. All of this is classic. What's innovative is the way the new chapter is indicated: by a boldface numeral in the right margin. Verse numbers are likewise set off in the margin, where they don't interrupt the flow of the text. I prefer this method, which is similar to what the designers of The Message Remix did, to the way the Books of the Bible project handles verse numbers, because there isn't as much of a learning curve for readers accustomed to the traditional approach. Ironically enough, while the NEB NT method doesn't allow for precision -- you aren't always sure exactly where on the line one verse ends and another begins -- I think it's actually a faster way to look up a passage than having the verse numbers inserted into the paragraphed text. In a sense, this approach gives you the advantage of an uncluttered, paragraphed text and the "Sword Drill" convenience we usually associate with verse-per-line formats. I'm impressed. The Message Remix, because it combines chapter and verse numbers in each citation and frequently groups them inside of listing each verse number on its own, doesn't work nearly as well. Also, take a look at the way the textual notes are handled. They're grouped at the bottom of the page with a discreet space separating them from the main text, but the text is not microscopic and the apparatus is simple and intuitive. Obviously, the more types of note you introduce, the less this approach is going to work, but this strikes me as an elegant, familiar solution to the problem of footnotes. Did I mention this thing is 7/8 of an inch thick? It's printed on nice, thick paper. You can see from the photos that there's bleed-through, but this edition originally sold for $1.45, so you can't have everything! The point is, all these sane, classic design choices present a challenge of sorts. This is a New Testament that's larger than many of today's compact Bibles. Imagine how thick it would have to be, all things being equal, if we added the Old Testament -- and don't even get me started about the Apocrypha. We'd end up with a brick of a paperback, which is fine with me, but not everyone's cup of tea. The lesson is simple. To make a one-column setting work, you have to get the proportions right between the text column and the page size, but you also have to think in terms of a thicker Bible, something in the region of two inches. A 6 x 9 x 2 inch Bible is going to be a bit of a monster, so page size needs to decrease as thickness increases, finding a golden mean which accommodates the text comfortably while feeling good in the hand. A single-column Bible is designed for reading, and that means it's designed for carrying, too. The NEB New Testament is a great example of what a single-column Bible should look like on the inside. In a future post, we'll look for examples of what the outside should be.